Runs for Cookies: Eddie Bauer review and giveaway! I've always been very thrifty when it comes to clothes, and my favorite place to shop is at garage sales (followed by Goodwill). BUT, running clothes (and shoes) are my one big splurge. I've learned that you just cannot beat the comfort and quality of GOOD (read: more expensive) running clothes. I've mentioned way more times than I care to count that I'm a huge fan of Under Armour for my running clothes. I spent a small fortune on the pieces I have (at least compared to my garage sale prices, haha); but I still have the pieces that I bought in 2010 and they are in fantastic shape. I do occasionally buy cheap items from Wal-Mart, but they usually only last a season. I really think that spending the extra money to get good quality running clothes is worth it! My initial impression: I loved everything! The tights were the fit that I like with the Under Armour tights. The waist went up high enough to feel like everything was held in tight (something I always liked before I had skin surgery--the compression kept my loose skin from bouncing and hurting). 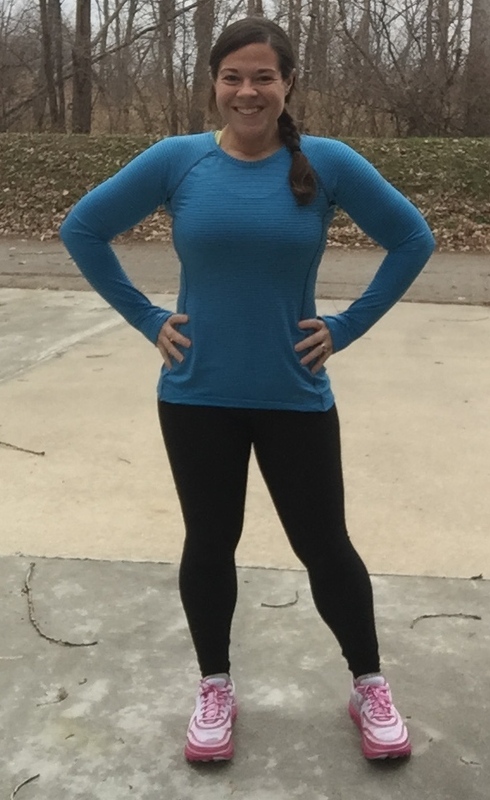 The fabric felt different than my Under Armour tights--it was really cozy and softer, and I worried that may cause them to slip down or something while running. The crew shirt was super comfy as well--a moisture-wicking fabric, but not at all scratchy (something I hate with cheap clothes). And the jacket was really nice--roomy enough to have a full range of motion, but not baggy or uncomfortable at all. The crew shirt is now my favorite long-sleeved tech shirt. Again, I love the fit: it's long enough so I don't feel like I have to keep tugging it down, it's fitted but not uncomfortably so, the seams don't cause chafing, and it has thumb holes on the sleeves. The fabric is really soft, but moisture-wicking. The fabric is meant to keep you warm in colder weather, and it certainly does that job well. The leggings are what surprised me the most. I've always raved about Under Armour Cold Gear tights, but I have to admit, I like the Eddie Bauer tights better. Because the fabric feels so soft, I worried it wouldn't wick moisture like the UA ones do, but they worked very well to keep me feeling dry. The seams are virtually unnoticeable, so I didn't have any problems with chafing. The biggest test was to see if I had to keep tugging on them to keep them pulled up. I went through the entire run without having to readjust or tug on the pants at all. I liked the outfit so much that I actually decided to wear it for the Monroe Half Marathon I ran, and then I wore the leggings for the Turkey Trot on Thursday. So comfy! (By the way, I found the fit to be pretty true-to-size. My leggings are a small and the shirt and jacket are both size medium.) Normally, when I review a product, I try to write positives AND negatives--but I honestly couldn't think of any negatives about these clothes. Maybe just the price? They are expensive, but I think the quality is worth it. As I mentioned, Eddie Bauer was kind enough to offer a $100 gift card to give away! To enter the giveaway, just fill out the form below. I'll close entries and randomly select a winner on Tuesday, December 2, 2014 at 2:00 PM EST. Good luck! I looove Eddie Bauer! We have outlets pretty close by and I always make a stop there! That jacket looks really awesome - love the rain repellent factor! Great review. I'm sold! I love my Adidas pants but my nike seem to fall in the back and so I never wear them on long runs. LOL. I will need try ua or Eddie Bauer next. I've been reading your blog backwards from start to finish--fitting in new posts as you write them, of course--and a giveaway seemed like the perfect opportunity to comment and gush. I really love what you're creating here; and it's really nice to hear both your struggles (you're normal, just like the rest of us!) and your successes. And though it seems like you may not love the responsibility of inspiring others, you really are an inspiration. I actually left a comment on your instagram post from the Drumstick Double (I'm outdoorsgurl) but I think I forgot to actually thank you for the insipration to get me back outside and running. I'm still working on the determination to make it a habit. But you've written a pretty good playbook at developing that. So thanks! Didn't even know EB made running clothes, definitely will check it out! I just found your blog through Pinterest and I've spent several hours reading your older posts. Thank you so much for sharing your struggles - I have problems with binging as well so hearing someone else talk about it and then show that you can control it was so very encouraging. Looking forward to reading more!! So glad you don't do sponsored posts. There's blogs I used to really like that I've mostly given up reading because they have become one sponsored post after another. It's a blogger's prerogative of course, but I see so many ads everywhere that I don't go to blogs to read more ads. I'm such an UA fan too that I have never even looked at EB for workout clothes. I've bought their clothes before, but not they're workout clothes. Will definitely give them a try! Thanks for checking them out, and I love how you don't do sponsored posts either. I love your "un-sponsored" posts because your honesty is always appreciated. I had no idea EB made running clothes--thanks for the recommendation! Looking great! I love the way those pants look - I'm self conscious about leggings but you're looking fabulous. Looks comfy and perfect for this winter's running! I love Eddie Bauer. I have a bunch of long sleeve shirts and hoodies from them and they are so soft and comfy. They also are long enough too. I could not agree with you more - the more expensive workout clothes last longer AND they are cute, which makes me want to wear them more. Shallow, yes, but anything that gets me moving is a good thing, right?? I did not know EB carried workout gear! I love the look of those tights and jacket! i have always been a fan of Eddie Bauer I had no clue they did workout clothes! Thanks for the giveaway! Another great place for running apparel deals is eBay. I buy tons of new and slightly used stuff there. Even shoes! I had no idea Eddie Bauer made running clothes! Now i'm heading over to take advantage of Black Friday. Thanks! I hadn't thought about Eddie Bauer for running clothes- they look great! I'm really confused about the tights. The site doesn't specify what weather they are meant for. I would have assumed they were all season based on the description. But you say they are similar to UA Cold Gear? Hmmm, good question! I just reread the email regarding the clothes, and it says they are part of their "Winter Collection"; but there is nothing written regarding the tights being meant for cold weather. To me, they feel similar to my UA Cold Gear, but maybe a little thinner fabric. I've worn them in cold temps, and they keep me as warm as the Cold Gear does. I wore them on Sunday for my long run, however, and wished I'd worn another layer. My legs were very cold! But the temp was in the 20's.